Grosbeaks are medium-large, distantly related songbirds with very thick, seed-cracking bills. They are mostly found in conifer and deciduous forests in North America. They belong in the finch and cardinal families. Their diet consist of seeds and fruits, and particularly during the winters, they will be frequent visitors to bird feeders. Grosbeaks are amongst the most colorful North American birds. Depending on the species, their plumage varies from reddish-purple to bright red, banana-yellow to gold, and bluish-black to a navy blue. They are highly sexually dimorphic (the male plumage looks very different from the female's). ... and their large beaks - derived from the French word "gros-bec," translated "big beak." The following is a list of grosbeak species - note that the groups of species are not each other's closest relatives - they share the name grosbeak purely because of morphological similarity. Evening Grosbeak C. vespertinus :Hooded Grosbeak C. abeillei : The Hooded Grosbeak s found in Central America, mostly in Mexico. Males resemble male Evening Grosbeaks but have completely black heads. Females resemble that species as well, but have black caps and lores (the regions between the eyes and bill on the side of a bird's head). Hooded Grosbeaks are smaller than their northern counterpart and have very different vocalizations. Japanese Grosbeak E. personata : The Japanese Grosbeak is a finch native to East Asia. The bird serves as the title/inspiration for a video game from Treasure Co. Ltd, called Ikaruga, which takes the bird's black-and-white coloration as inspiration for its primary gameplay mechanic. Collared Grosbeak M. affinis : The Collared Grosbeak is found in Bhutan, China, India, Myanmar, Nepal, Pakistan, and Thailand. Its natural habitat is boreal forests. Spot-winged Grosbeak M. melanozanthos : The Spot-Winged Grosbeak is found in Bhutan, China, India, Laos, Myanmar, Nepal, Pakistan, Thailand, and Vietnam. Its natural habitats are subtropical or tropical dry forests and subtropical or tropical moist montanes. White-winged Grosbeak M. carnipes : The White-Winged Grosbeak is found in Afghanistan, Bhutan, China, India, Iran, Myanmar, Nepal, Pakistan, Russia, Tajikistan, Turkmenistan, and Uzbekistan. Its natural habitat is boreal forests. Red-and-black Grosbeak, Periporphyrus erythromelas: The Red-And-Black Grosbeak is a species of cardinal (bird) in the Cardinalidae family. It is found in Brazil, French Guiana, Guyana, Suriname, and Venezuela. 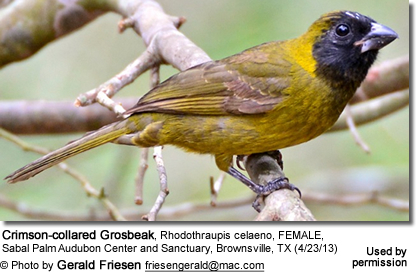 This bird species inhabits subtropical or tropical moist lowland forests. Yellow-green Grosbeak C. canadensis : The Yellow-Green Grosbeak is a species of cardinal (bird) in the Cardinalidae family. It is found in Brazil, Colombia, French Guiana, Guyana, Panama, Suriname, and Venezuela. Its natural habitats are subtropical or tropical moist lowland forests and heavily degraded former forest. Yellow-shouldered Grosbeak Parkerthraustes humeralis: The Yellow-Shouldered Grosbeak is a species of cardinal (bird) in the Cardinalidae family, or possibly a tanager (Thraupidae). It is the only member of its genus Parkerthraustes. It is found in Bolivia, Brazil, Colombia, Ecuador, and Peru. It inhabits subtropical or tropical moist lowland forests. Crimson-collared Grosbeak, Rhodothraupis celaeno: The Crimson-collared Grosbeak is a medium-size seed- and leaf-eating bird in the same family as the Northern Cardinal, Cardinalidae. The Crimson-collared Grosbeak is primarily found in northeastern Mexico from central Nuevo León and central Tamaulipas south to northern Veracruz; however, it occasionally strays into the Rio Grande Valley of southern Texas, mostly in winter. Mature males have black plumage with a dull red (Sibley 2000) or pinkish red (Howell and Webb 1995) "collar" on the nape, shoulders, and belly (much like the Crimson-collared Tanager); the belly is mottled with black. Mature females have a black head and breast like males but greenish upperparts and yellowish underparts. Young birds are similar to females but have less black. The beak is black, big and stubby, with the upper beak jutting roughly perpendicular to the forehead. The song is a warble, often slurred upward at the end. Calls are penetrating whistles starting with an "s" sound, slurred downward or one upward followed by one downward. The Crimson-collared Grosbeak inhabits humid or semi-arid forest and second growth, from low to high levels, sometimes skulking on the ground. It occurs singly, in pairs, or in mixed-species flocks. The nest is a bulky cup made of grass and twigs and placed in a bush. The female lays two or three pale blue-gray eggs with brown markings. Yellow Grosbeak (or Mexican Yellow Grosbeak), Pheucticus chrysopeplus : The Yellow Grosbeak is a medium-sized seed-eating bird in the same family as the Northern Cardinal, "tropical" or "New World" buntings, and "cardinal-grosbeaks" or "New World" grosbeaks. The Yellow Grosbeak occurs on the Pacific slope of Mexico from central Sonora to northwestern Oaxaca, and in southern Chiapas and Guatemala. In Sonora it is migratory. It has been considered conspecific (of, or belonging to, the same species) with P. tibialis of Central America and P. chrysogaster of South America. It occurs mostly in trees in forest, woodland, and edge, but generally not dense rain or cloud forest. Occasional vagrants have reached the United States, mostly in summer in Arizona, but it has also been reported from California, New Mexico, and even Iowa. It is considerably bigger than its North American congeners, the Black-headed Grosbeak and the Rose-breasted Grosbeak, being about 21.5–24 cm (8.5–9.5 in) long and weighing on average 62 g (2.2 oz). The head is "massive" (Sibley 2000), and the gray-black bill is even bigger in proportion to the head than those of its northern relatives. The plumage has bold contrasts of yellow, white, and black or gray. Males' head and underparts are solid yellow—light lemon in most populations, "brilliant golden-orange" (Howell and Webb 1995) in P. c. aurantiacus of Chiapas and Guatemala. The back is black with yellow mottlings, the rump is yellow, and the upper tail coverts are black with white tips. The wings and tail are black with conspicuous white spots, patches, and wingbars. Females are similar but the upperparts are more olive, with dark streaks on the crown and back. Black is replaced by gray, and the white markings on the wings, especially the white base of the primaries (longest wing feathers), are smaller. Females are very similar in pattern to female Flame-colored Tanagers, but much bigger, especially as to the bill. Immatures resemble females overall. Typical calls are a metallic iehk or plihk (Howell and Webb) or piik (Sibley) resembling other Pheucticus grosbeaks' calls, and a soft whoi or hu-oi (Howell and Webb 1995) or hoee (Sibley 2000) often given in flight. The song is a variable, rich-toned warble resembling that of the Black-headed Grosbeak, but shorter. As is typical of the genus, it lays 2 to 5 pale bluish to greenish eggs with heavy brown and gray speckling. The cup nest is built at medium height in a bush or small tree. Ultramarine Grosbeak C. brissonii : The Ultramarine Grosbeak is a species of cardinal (bird) in the Cardinalidae family. It is found in Argentina, Bolivia, Brazil, Colombia, Paraguay, Uruguay, and Venezuela. Its natural habitats are subtropical or tropical dry forests, subtropical or tropical moist lowland forests, and subtropical or tropical dry shrubland. Blue-black Grosbeak C. cyanoides : The Blue-Black Grosbeak is a species of cardinal (bird) in the Cardinalidae family. It is found in Belize, Bolivia, Brazil, Colombia, Costa Rica, Ecuador, French Guiana, Guatemala, Guyana, Honduras, Mexico, Nicaragua, Panama, Peru, Suriname, and Venezuela. Its natural habitats are subtropical or tropical moist lowland forests and heavily degraded former forest. 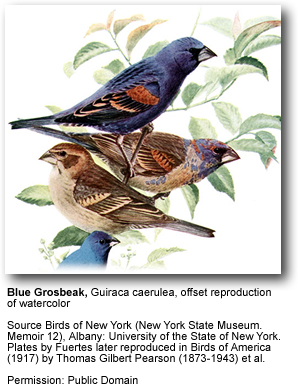 Glaucous-blue Grosbeak Cyanoloxia glaucocaerulea of eastern South America : The Indigo Grosbeak, also known as the Glaucous-blue Grosbeak, is a species of bird in the Cardinalidae family. It is found in Argentina, Brazil, and Uruguay. Its natural habitats are subtropical or tropical moist lowland forests, subtropical or tropical moist shrubland, and heavily degraded former forest.